If you've visited the store recently to pick up Valentines for your toddler's class, you probably noticed that candy dominates. While I am pro-candy for myself and my older child, we don't give candy to our toddler. However, he definitely enjoys other snacks, including Slammer's Snacks! 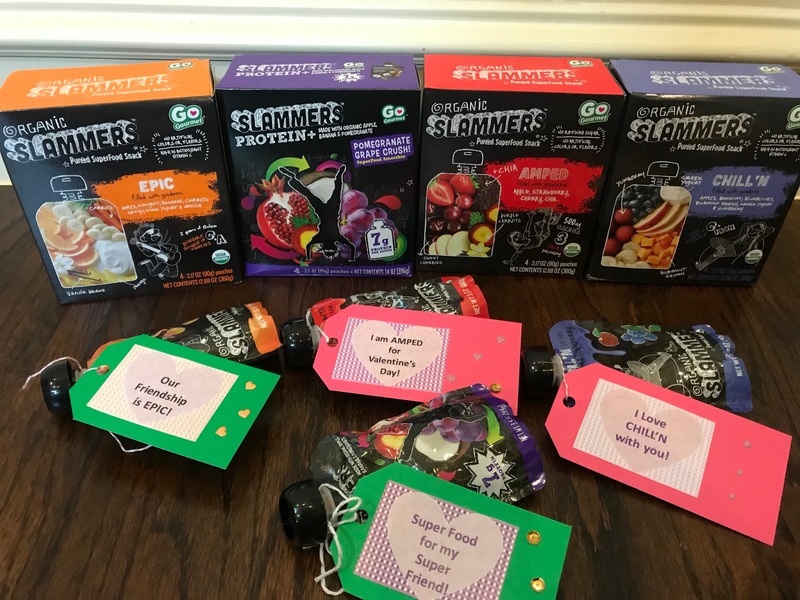 In today's post, I'll share some ideas for you to rock Valentine's Day for your toddler -- Valentine's Day Baby Food Pouches for their classmates! If you have a toddler, I am sure that you are well aware that baby food pouches are all of the rage! My toddler and his little friends can't get enough of them. This makes them perfect for Valentine's Day! Just add a cute tag and you have a fabulous Valentine. 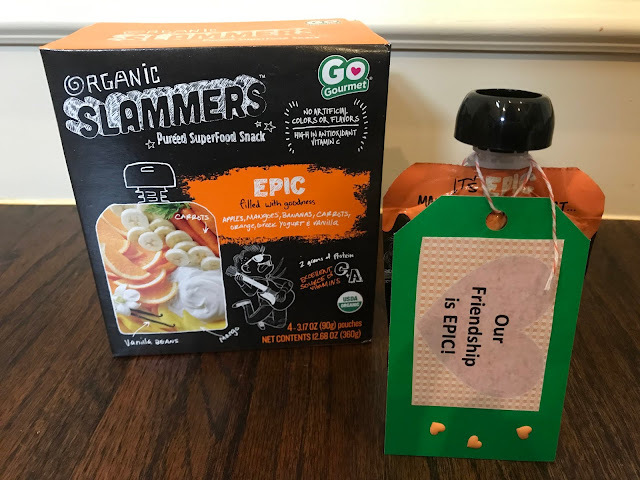 Personally, we used Slammer's Snacks from Baby Gourmet because they taste fabulous, contain nutritious ingredients (including protein in many varities! ), and have names that are easy to work into adorable Valentine's Day cards. Slammer's Snacks are easy to find at Kroger, Tom Thumb, Amazon, or even Costco. 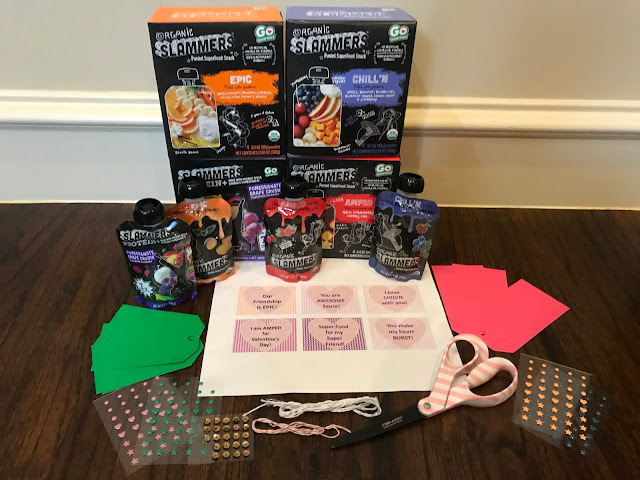 It was easy to create the Valentine's Day treats below with my toddler. I created the labels and tied them onto the pouches. My toddler added stickers. Once you print the labels, gather some card stock, twine, stickers, scissors and a glue stick. 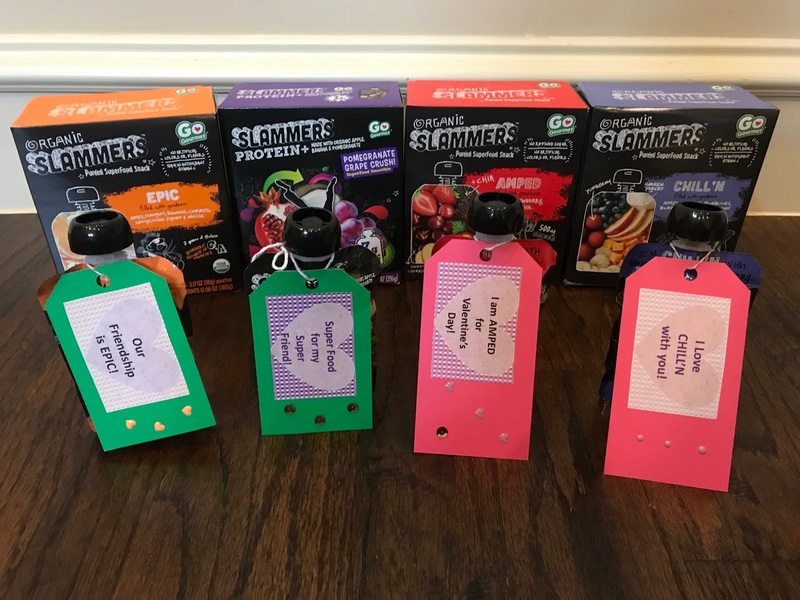 Add the labels to your cards. I used card stock and a glue stick. Let your toddler add stickers to their cards and then attach them to each pouch with twine. 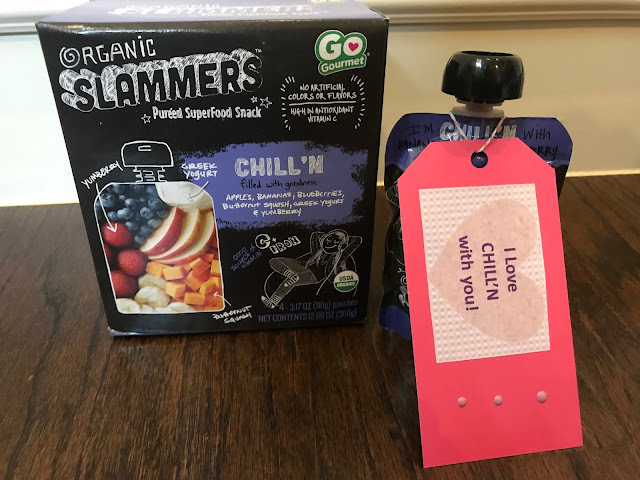 Combine the CHILL'N pouch with, "I Love CHILL'N with You!" 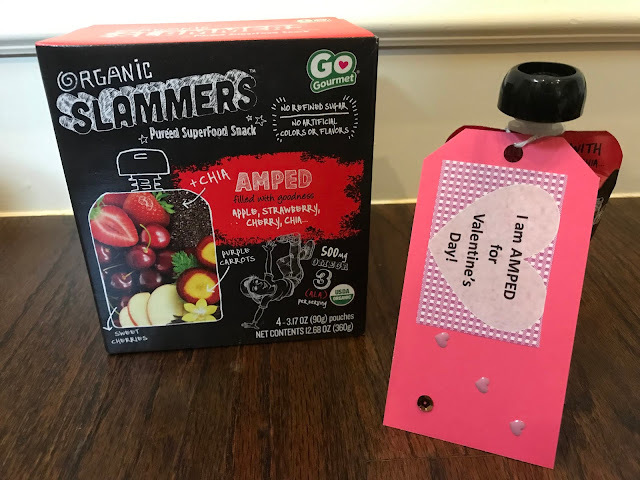 Combine the AMPED pouches with, "I am AMPED for Valentine's Day!" 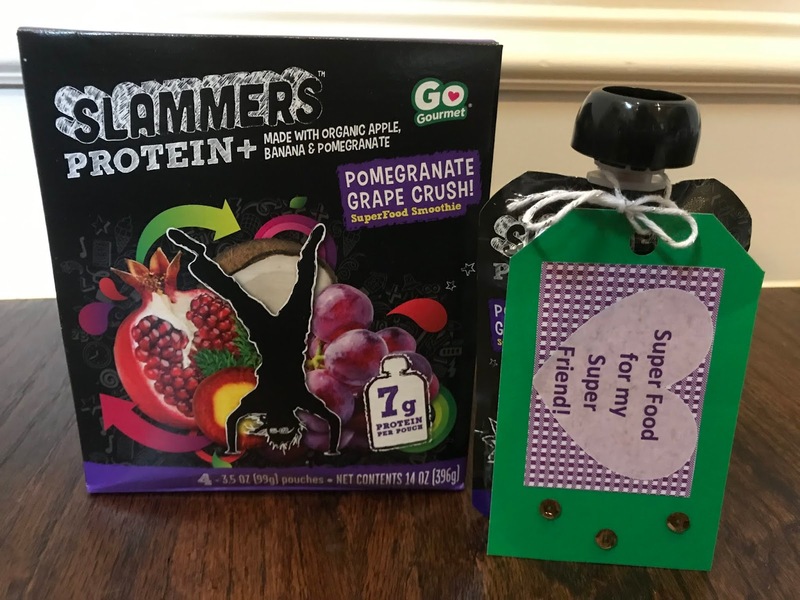 Combine the Pomegranate Grape Crush with, "Super Food for my Super Friend!" I hope that you enjoy these toddler-friendly Valentine's treat ideas! 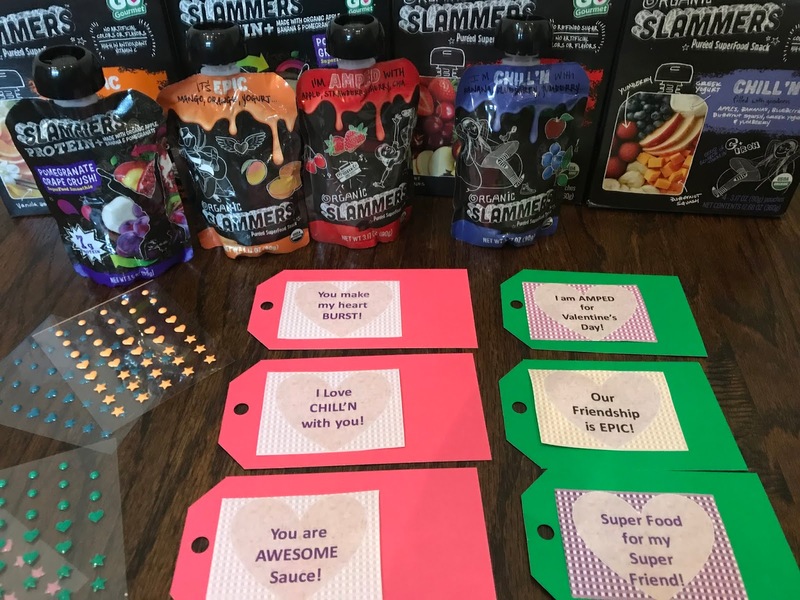 Visit Slammers Snacks here to find a location that sells the pouches that we used in this post.